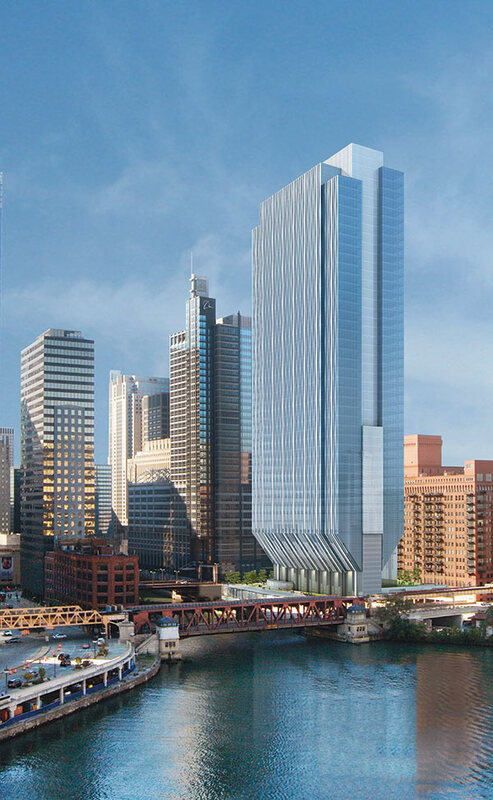 Goettsch plants a tall tower with a slim footprint on the Chicago River. At a meeting downtown to unveil their plans for Chicago’s latest riverfront skyscraper, architect Jim Goettsch and developer John O’Donnell confronted a public somewhat skeptical of the building’s unusual shape. “It looks like a giant tuning fork,” said nearby resident John Middleton. Critic Lynn Becker compared it to a punch stamp. 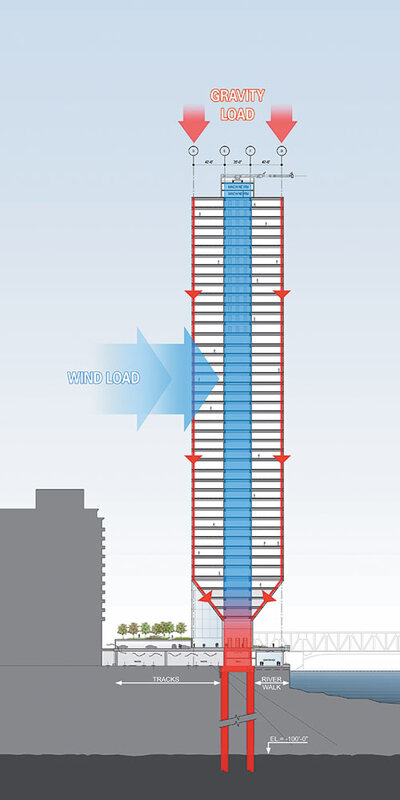 At 53 stories, the structure planned for 150 North Riverside Plaza is among the largest developments in Chicago since the recession. But the high rise’s slender footprint and ample green space make it seem delicate next to its bulkier neighbors. “In some ways it may look counter-intuitive,” said Goettsch, “but it’s an extremely well-designed structure.” With Magnusson Klemencic Associates and Thornton Tomasetti doing peer review, there’s little doubt about its solidity. In fact, Goettsch said during another interview that the concrete-steel composite is fairly conventional. The form recalls Goettsch’s Sowwah Square, a complex in Abu Dhabi that took home the Council on Tall Buildings’ and Urban Habitat’s 2013 Best Tall Building Award for the Middle East & Africa region. With Sowwah, the clients asked for “iconic” design, said Goettsch, but not a super-tall structure. 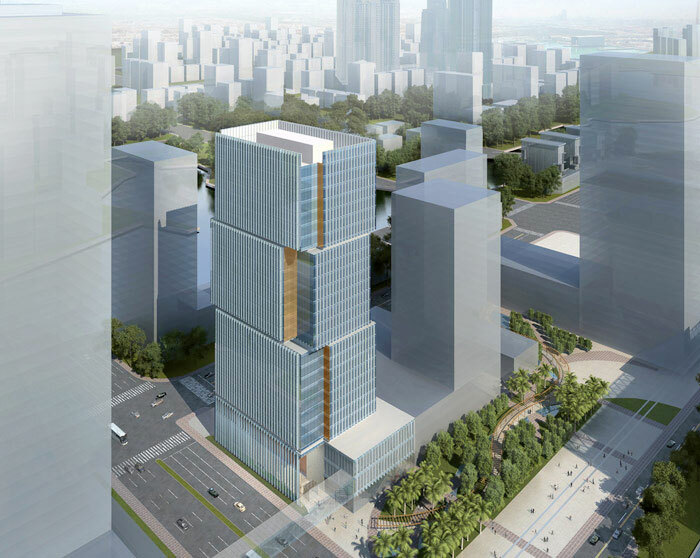 The end result is a series of towers that appear to have been lifted 10 stories off the ground, opening up to a shared plaza. 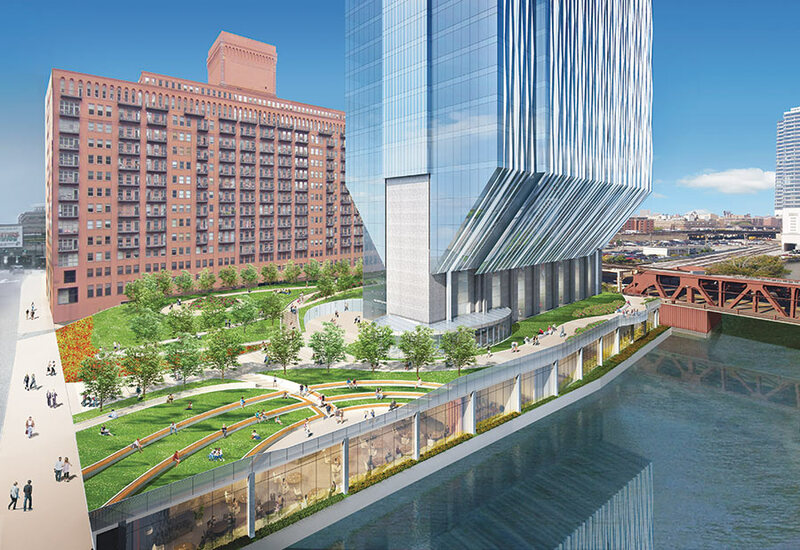 Along with River Point to the north, the new project continues the Chicago riverwalk. Goettsch reprised the solution in Chicago for entirely different reasons. Vacant for decades, the site is divided by railroad tracks. Amtrak owns the farthest west parcel, and has a permanent easement on the city-owned middle parcel. That leaves only a small riverside plot for O’Donnell’s 1.2 million-square-foot office building, especially since the law curtails development within 16 feet of the tracks’ centerline, and within 30 feet of the river. O’Donnell bought that parcel in December 2011 for $12.5 million and later negotiated for air rights over Amtrak’s property. 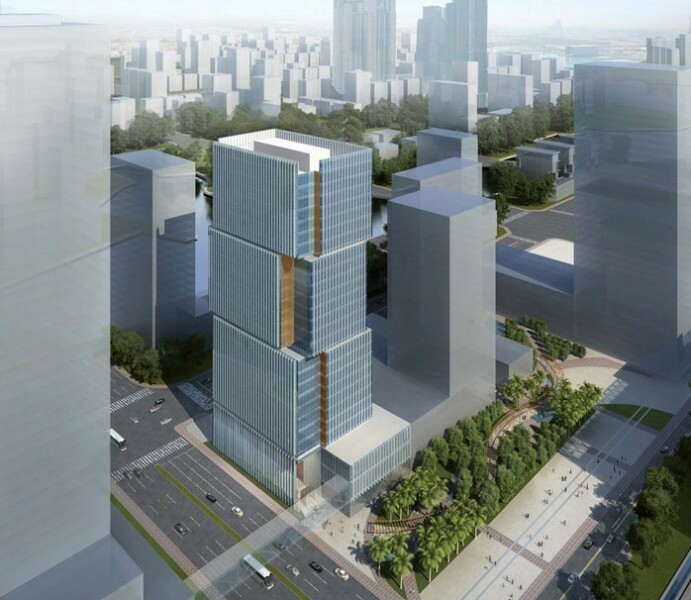 Earlier proposals called for two towers, sharing several stories of parking. Once a scaled-back development satisfied his calls for a riverwalk and park space, Alderman Brendan Reilly handed over the city-owned parcel. The alderman rejected requests for tax increment financing. “We’ve essentially capitulated to everything [Reilly] wanted,” said O’Donnell. Out of that wrangling came a substantially leaner footprint, totaling one tower and just one story of parking with 81 spaces. The garage will be covered over with a park that gently slopes up to the west, ending with a glass railing roughly 13 feet above the adjacent alleyway. “There was a concern that what we were doing was very corporate,” O’Donnell said. 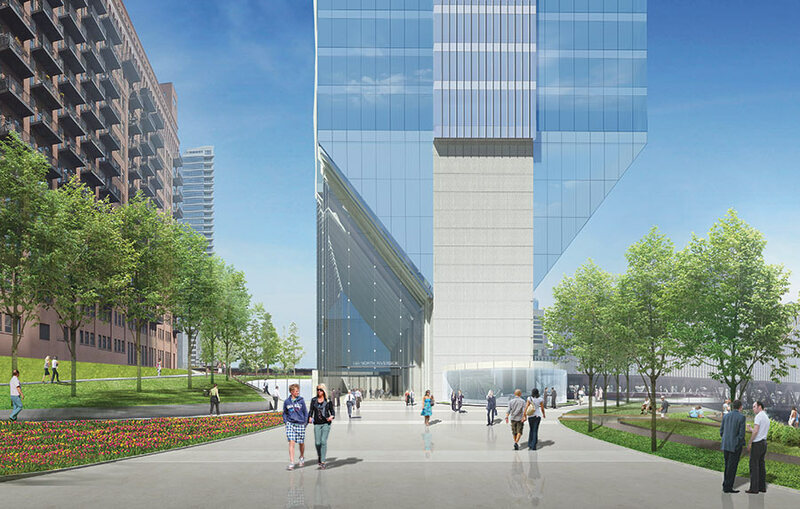 So the design now vies to achieve an effect that O’Donnell called “Millennium Park light.” As the building tapers toward its base, it makes way for a glass cable net wall enclosed lobby that opens to the west. It also leaves room for a grassy hill, scalloped with curvilinear walkways. “It’s like a ballerina,” said landscape architect Ted Wolff. “It’s a muscular building, but it’s on point.” Tree-lined walkways traverse the site north to south on either side of the building. The riverfront path jogs east as it passes beneath the structure’s elevated mass. Although the southeast corner features a small landscaped amphitheater meant to focus attention on the river itself, all interaction with the river is from street-level. 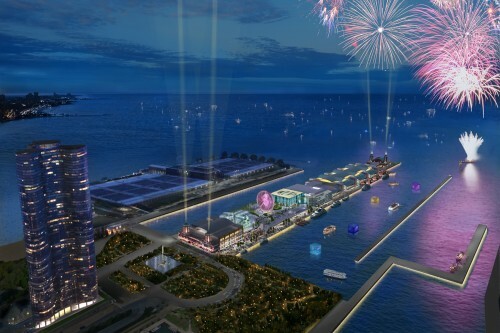 Dock-level facilities like a fitness center and a white tablecloth restaurant enjoy views but no direct access. 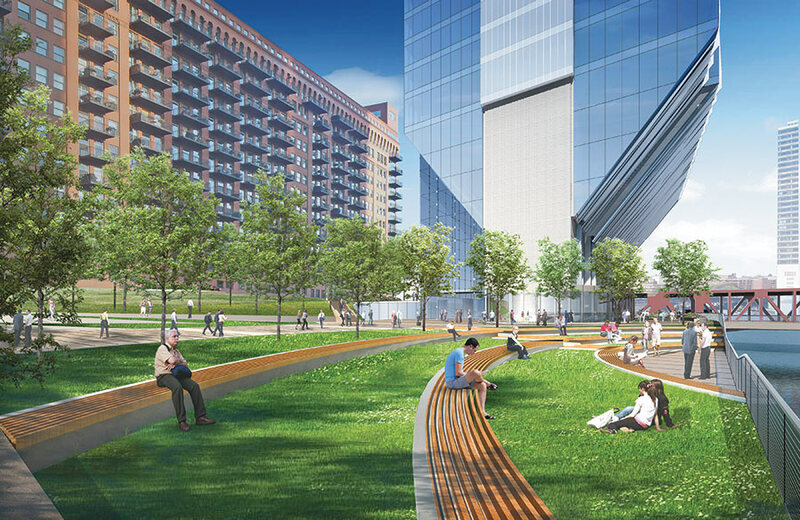 Still, including street crossings and stairs, there could be a continuous riverwalk from the building’s northern neighbor, the planned River Point development, south to the former Chicago Daily News building. 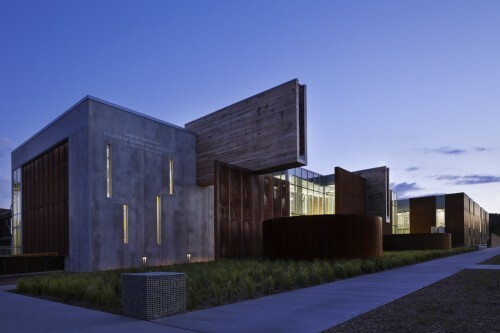 The building’s facade also draws inspiration from the river. Weary of overly reflective glass towers, Goettsch Partners dialed back the exterior reflectivity to between 15 and 25 percent. Mullions project between 6 and 17 inches to form undulating fins that mimic the visual effect of wind on water. Amid that wave-like shape, columns spaced every 30 feet lend texture to the glassy expanse. Still awaiting tenants, the building could break ground in mid-2014 and wrap up 28 months later. 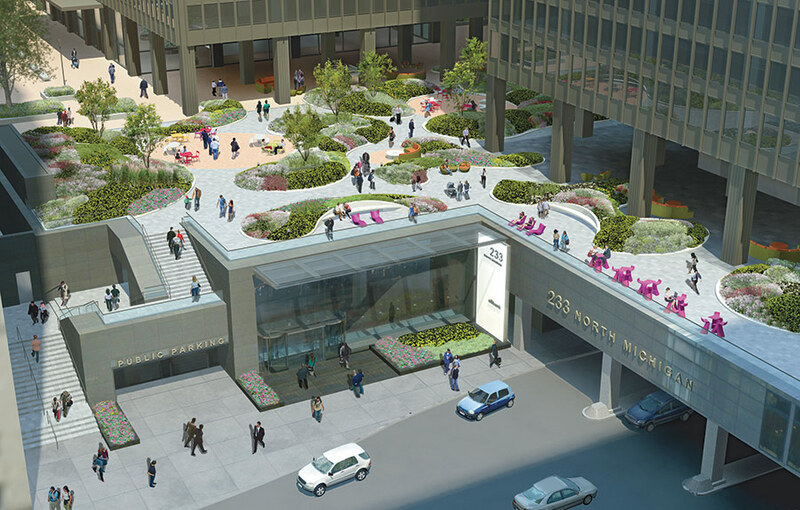 Landscaping aims to make a Mies plaza feel like a lush park. 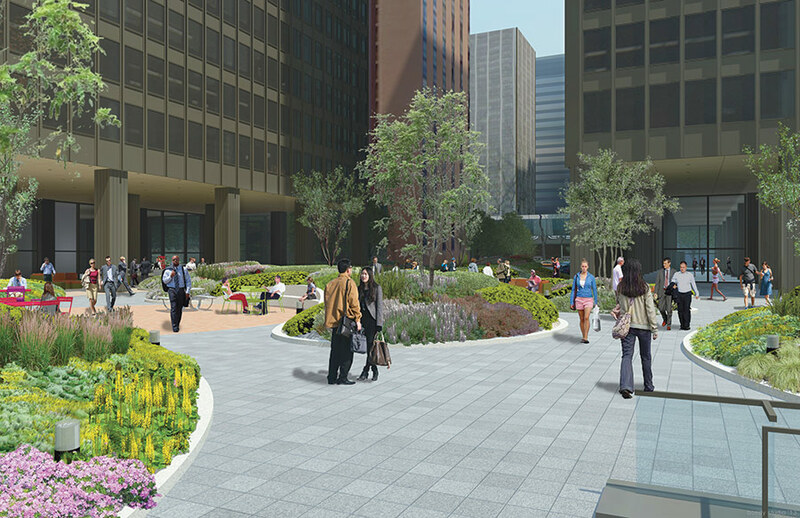 Plans for an aging Ludwig Mies van der Rohe plaza in downtown Chicago are not so much an update as a transformation. In renderings from Wolff Landscape Architects and Goettsch Partners, amoeba-like forms wrap around Mies’ black steel columns, bearing lush berms three to five feet high. When landlord Reit Management & Research acquired the building in 2010 and 2011, they recognized the need for renovations. Water damage threatened parts of the structure as well as the terrazzo plaza linking East Wacker Drive and North Michigan Avenue. Stairs connecting the Water Street entrance with the plaza overhead had been closed years ago due to water damage, further obscuring an already underused gateway between Michigan Avenue and North Stetson Avenue to the east. Since the stairs closed, high-rise construction has recast the area east of Michigan Avenue as Chicago’s “New Eastside.” As a logical link to Michigan Avenue, the restored plaza could serve as a new entryway to the neighborhood. 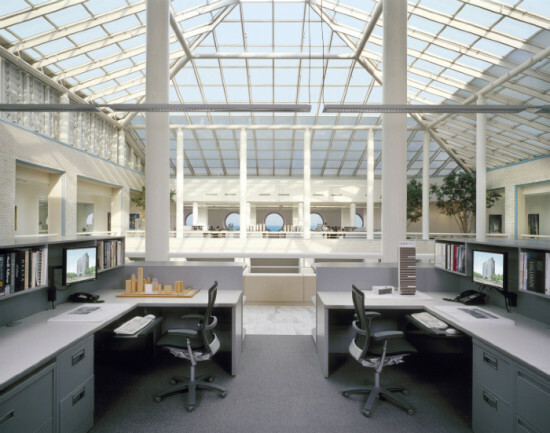 Although they share a public space, 233 North Michigan Avenue (whose entrance actually sits just east of Michigan on Water Street) and 111 East Wacker Drive span three floors. At 30 and 35 stories tall, the towers cast shade on the plaza for much of the day, creating a sense of coldness on the flat expanse. The landscaping features shade-tolerant plants like wild ginger, common periwinkle, ward’s yew, and apple serviceberry. A fire pit, free wifi, and movable, brightly colored furniture are among the plaza’s enticements to linger in what has been largely a throughway for office commuters. 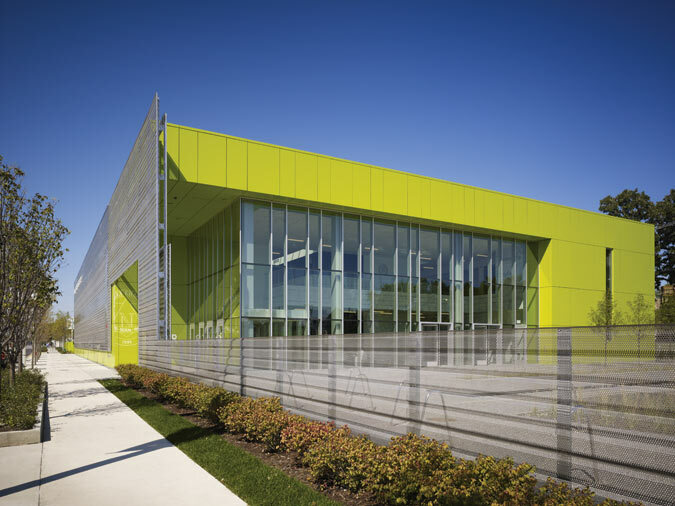 The design’s varied amoeba-like forms adhere to a rigid geometry with radii of 4, 8, 16, or 32 feet. The landscaped forms rise three to five feet in the middle, high enough to obscure a seated person’s view and convey the coziness of a park. Movable furniture affords visitors a little control of where they sit and red pavers accent some portions of the concrete walkways. The project announces its presence on Michigan Avenue with an LED-backlit “Illinois Center” sign placed where the building’s lower levels straddle Water Street. Renovations also include consolidating the Americans with Disabilities Act–compliant entrance with the building’s main vestibule on Water Street. Construction is underway. A partial opening is planned for this winter. A full opening is planned for spring. 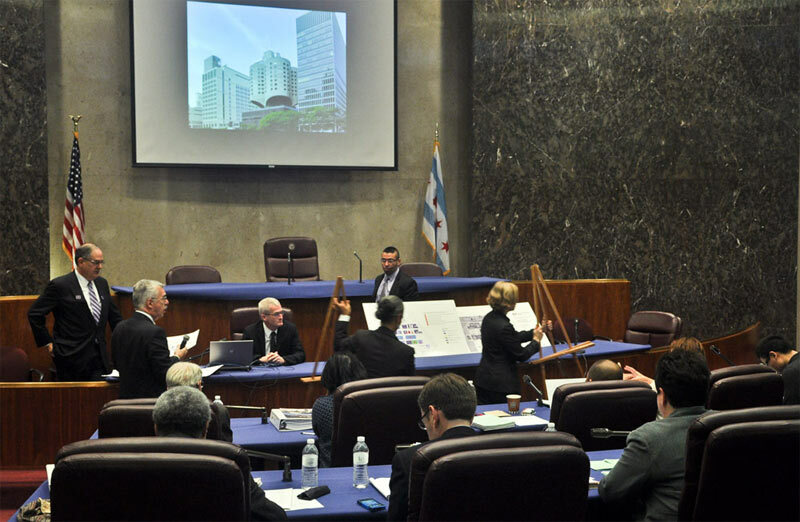 The Commission of Chicago Landmarks reviews the Prentice Hospital. 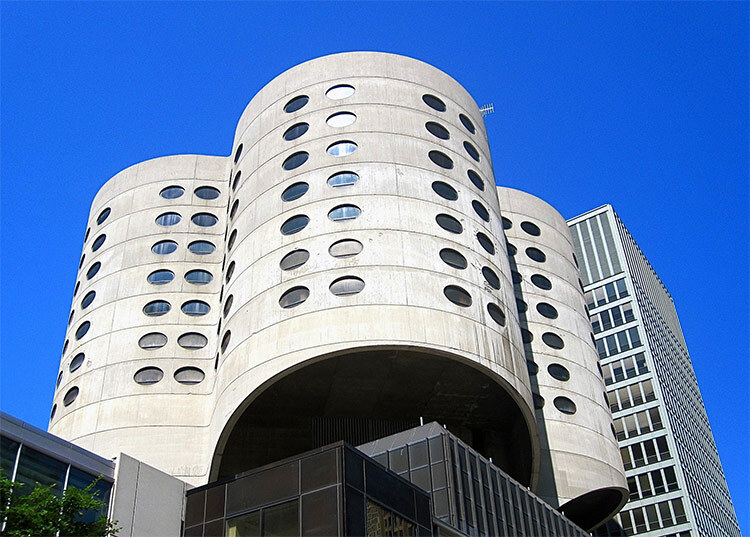 A six-hour meeting to decide the fate of Bertrand Goldberg’s Old Prentice Women’s Hospital in Chicago ultimately denied the building landmark status, voting to recognize its merits for preservation and then withholding protection from demolition. After months of pleas for a hearing before the commission, a coalition of those in favor of preserving Prentice were surprised to learn the agenda that they had fought so long to realize also contained an apparent out for political expediency. 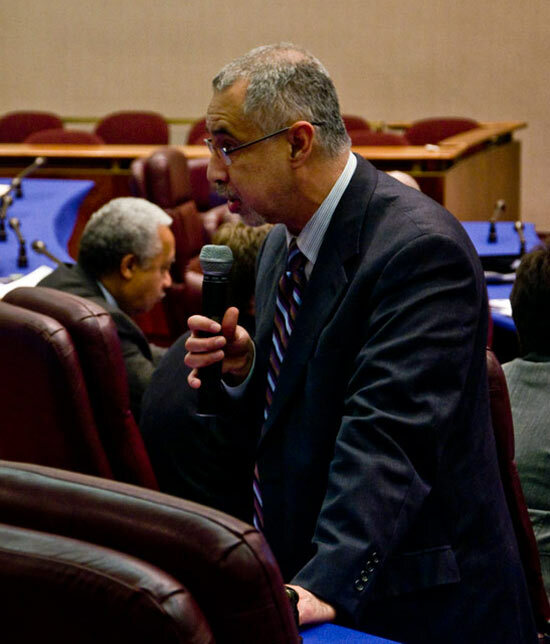 The agenda included a second vote following the decision to grant preliminary landmark status that would rescind the commission’s own vote to protect Prentice — a mechanism Preservation Chicago’s John Fine said was unprecedented in the body’s recent history. “This rigged proceeding,” Fine said at a press conference held the morning of the commission meeting, “is denying Prentice its so-called day in court.” The fix was in two days prior, however, according to many in the Save Prentice Coalition. In a move that many deemed a veritable death knell, Mayor Rahm Emanuel voiced his support for demolition in a Chicago Tribune op-ed on the same day the commission agreed to hear Prentice’s case. Landmarks commissioners are appointed by the mayor. Nonetheless preservationists turned out in droves, forcing the commission’s meeting to move to City Council chambers. The commission’s own report detailed the building's merits, anticipating their 9-0 recommendation for landmark status. In the nearly two hours of public comment that transpired between the commission’s report and their initial vote, a parade of architects and preservationists came to praise architect Bertrand Goldberg’s design and challenge the prevailing notion that saving old Prentice precluded any new construction by owner Northwestern University on the site or nearby. 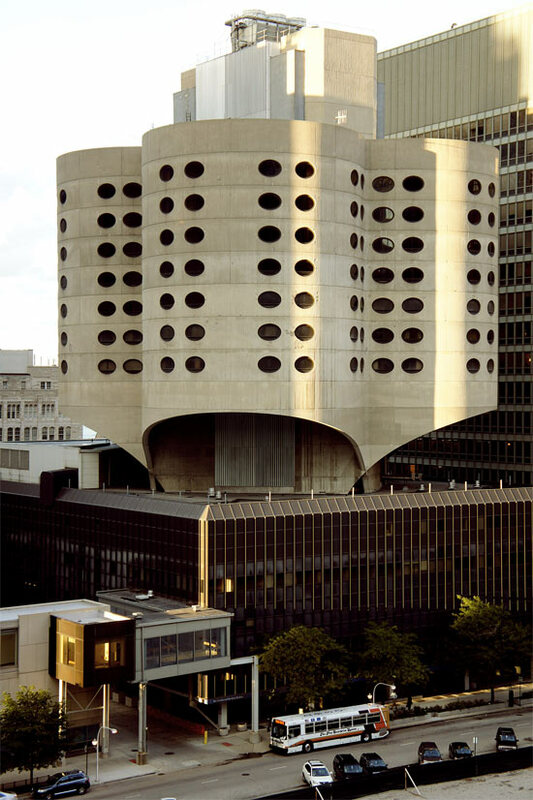 “Other cities will follow your lead,” said Bertrand Goldberg’s son, architect Geoff Goldberg. “The stain [of demolition] will run long and deep. It will last.” More than 65 architects, including Frank Gehry and Jeanne Gang, signed an open letter in July that called on City Hall to preserve the iconic structure. The Save Prentice coalition later delivered a petition with more than 3,500 signatures to Emanuel’s offices. Landmarks Commission chairman Rafael Leon. Not everyone with a design background sided with preservation. Representatives from Goettsch Partners, HOK, and Thornton+Tomasetti cited structural concerns and said Prentice did not stand out among Goldberg’s work. Andrew Mooney, the city’s commissioner of Housing and Economic Development, argued new construction would bring jobs and research dollars that outweighed the importance of preserving Prentice. The majority speaking in favor of demolition, though, put the debate in no uncertain terms, pitting “nostalgia for an intriguing architectural example” against “saving lives and economic recovery.” Northwestern hopes to build a new medical research center on the site. The university has dismissed reuse studies as infeasible, citing stringent technical requirements for use as an active laboratory. Preservationists pointed to Northwestern’s massive real estate portfolio — by some accounts 44 percent of the Streeterville neighborhood, including an empty lot across the street from Prentice — and accused the University of presenting a false choice between medical advancement and economic development on one hand and architectural heritage on the other. Landmarks commission chairman Rafael Leon took offense to that notion. “This is about a building,” Leon said. “We are all in favor of preserving lives.” But, he said at the meeting’s conclusion, just because a building meets the commission’s criteria for landmark designation does not mean it warrants it. City ordinance prevents commissioners from explicitly considering economic concerns in evaluating their criteria for preservation, but it does allow for consideration within a “larger framework” of civic issues. There was just one holdout on the critical vote to revoke the commission’s earlier recommendation for landmark status — commissioner Christopher Reed. Afterwards Reed said the process reminded him of losing Michael Reese Hospital, a south side modernist and Prairie-style complex designed by the likes of Walter Gropius and Hideo Sasaki among others. Mayor Richard M. Daley rushed plans for that site through a hasty process that stymied public comment. The predominantly limestone campus of Northwestern University is about to get a bold new addition, one that looks to the Evanston Lakefront and back toward the Chicago skyline. The new home of the Bienen School of Music will feature a monumental window that frames views of downtown Chicago, providing a dramatic backdrop for the performers in the recital hall. “Though it’s located in Evanston, the University wanted to underscore the proximity to Chicago, to show students that they are on a world class stage,” said president Jim Goettsch. The 152,000 square foot building includes a 400-seat recital hall, a 150-seat performance room for opera, and a 2400 square foot rehearsal room and library, as well as offices and classrooms. A large atrium space will serve as a pre-event gathering space connecting the various halls. 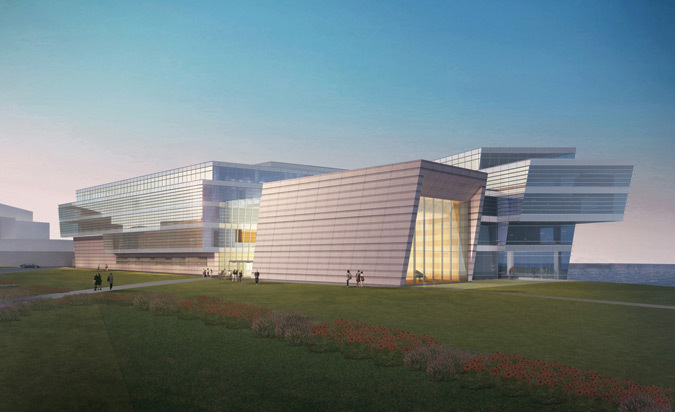 The Z-shaped plan and the glass and steel cladding will make the building a contemporary presence on campus, as well as a highly visible public face for the Evanston and greater Chicago community. 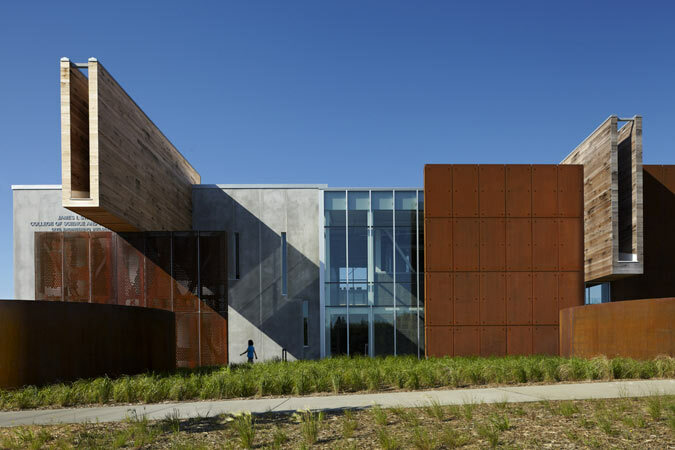 Located near the dance, theatre, and other fine and performing arts facilities, the Bienen School completes an “arts circle” at the university, with a broad, accessible lawn in front that also includes Lakefront access.